"Finally…a book on basic electricity that is not only good, but easy and FUN as well!" 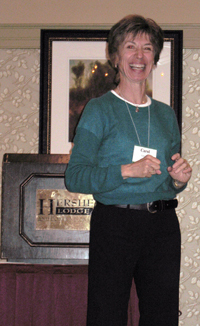 At any given time you can find Carol speaking at gatherings of electrical and HVAC professionals. Her seminars cover such topics as Quick & Basic Electricity, Quick & Basic Hydronic Controls, Quick & Basic Troubleshooting, Quick & Basic House Wiring, Gas Combustion Controls, and Indoor Air Quality. If you would like to book Carol to speak with your group, please contact us via our web site, or call us at 303-795-9350.